Authors: M. Küppers, L. O’Rourke, D. Bockelée-Morvan, V. Zakharov, S. Lee, P. von Allmen, et al. 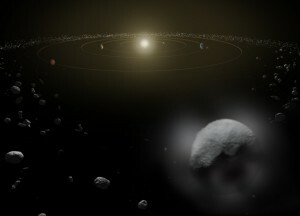 Ceres is one of the newly defined dwarf planets along with Pluto and is the largest object in the asteroid belt. Astronomers have now detected plumes of water vapor emanating from the dwarf planet, indicating the presence of water ice in the interior or on the surface of Ceres. The water vapor was detected with the far-infrared space observatory, Herschel. Herschel was not able to spatially resolve the surface features, but Küppers et al. 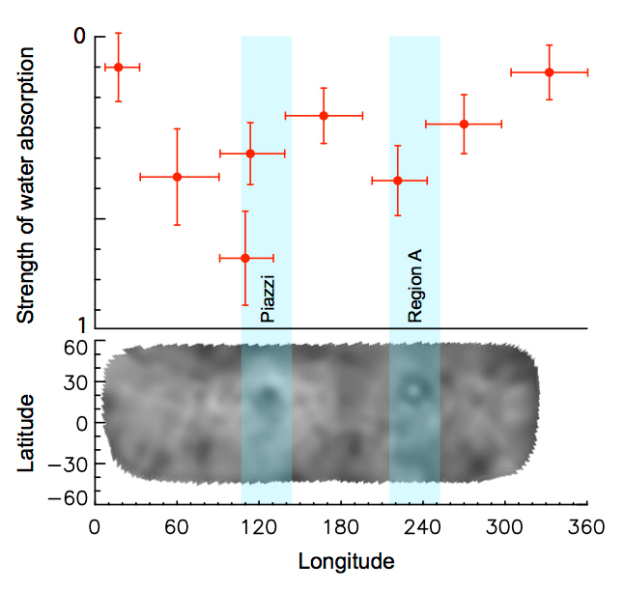 were able to determine the location of the water vapor source on the surface of Ceres by monitoring variations over the span of the asteroid’s rotation. Figure 2 shows the strength of the water vapor absorption line over the period of the Ceres’ rotation. Overlaid on the bottom is an image of Ceres taken by the Hubble Space Telescope. Hubble saw two dark spots in the near-infrared image, named Piazzi and Region A. 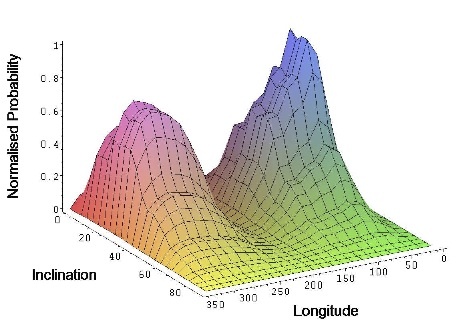 Figure 2 demonstrates that as the dark spots rotated in and out of view, the absorption features changed in strength. This indicates the spots are the source of the water vapor. Figure 2 – Figure from Küppers et al. (2014) demonstrating how the strength of the water vapor feature changes as Ceres rotates. Panel (a) show the relative absorption strength vs rotation angle and panel (b) displays a map of the surface taken with the Hubble Space Telescope. The absorption feature is strongest (i.e. the data points are lowest on this flipped axis) when the dark spot Piazzi and Region A rotate into view, indicating a correlation between those spots and the water vapor. The absorption features also changed over successive observing periods. The water vapor was not initially detected when Ceres was farthest from the sun at a distance of 2.94 AU (an AU, or astronomical unit, is the earth-sun distance). The water vapor absorption was later strongly detected as Ceres moved closer to the sun, at 2.72 AU. This rapid change in the presence of water vapor over a short radial variation indicates a steep increase in the rate of water evaporation as Ceres gets closer to the sun. 1) Comet-like sublimation of surface ice: (sublimation is like evaporation, except that frozen material goes directly into the gaseous state without entering the liquid state first). When the surface ice of a comet sublimates, it drags surface dust with it, thereby revealing a new layer of ice on the surface. In this way, the surface can be continually replenished with ice for sublimation. 2) Geysers or Cyrovolcanoes: Cyrovolcanoes are volcanoes that spew out ice instead of molten rock. This mechanism requires an internal heat source to fuel the volcanoes. Saturn’s moon Enceladus has water geysers that are powered by tidal heating. This is not the case for Ceres, but its interior could be heated by long lived radioactive isotopes. Currently, the data aren’t sufficient to distinguish between the two mechanisms. The best way to do this would be to monitor Ceres over the course of its orbit around the sun. Cometary activity is greatest when the comets are closest to the sun (this point in the orbit is called perihelion). If comet-like sublimation of surface ice is responsible for the water vapor around Ceres, then there should be noticeable variation in the output over the course of its orbit. Cyrovolcanism, however, is powered by an internal heat source, and therefore should not be affected by the asteroid’s orbit. The current observations of the long term variation point towards the cometary sublimation as an explanation, but the data are insufficient to be conclusive. 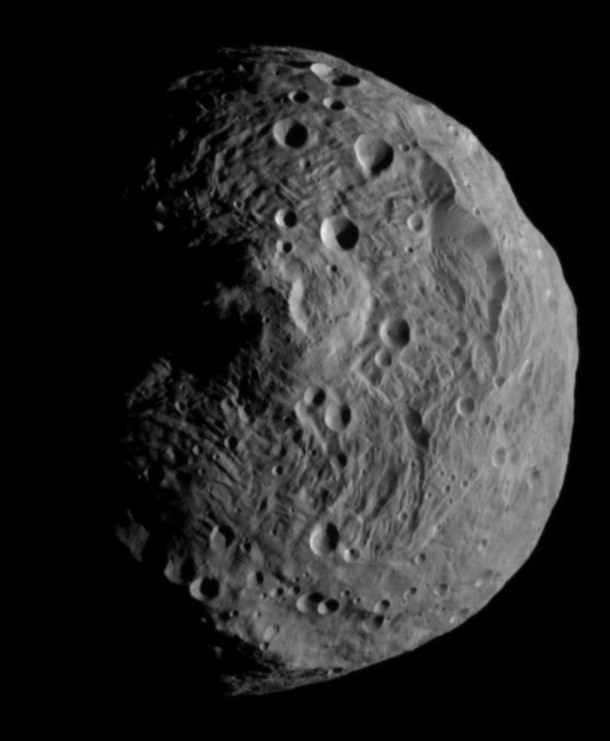 The Dawn spacecraft, however, is on its way to Ceres, and should be able to clear up this issue. Dawn will arrive in 2015, and will be monitoring the water vapor closely. So stay tuned. It is dissapointing that you discuss a Nature paper that can not be accessed without paying. I always liked the astrobites exactly because you talked about papers that could be viewed via arXiv by EVERYONE. That made it possible to read the original paper as well as your article which I find very important. It is bad enough already, that universities publish press releases WITHOUT including the full-text of the paper the press release is based upon. Especially if the data comes from a telescope that was founded with public money…. Working at a University I often forget that these papers are behind a paywall for the public. I too find it disappointing when papers are not readily available for everyone to read. That being said, I think this is an important paper to discuss. For those who cannot access the paper, this post provides more information than a typical press release. That is why I chose to review this paper in the end. Fighting for open access is a bit beyond the scope of Jessica’s astrobite, but this conference proceeding looks like it has some details about the work.